Find My Workspace lists over 95% of the business centres market in Northampton. Simply click Request Quote to check pricing for one office, or Add to Basket for multiple offices. This centre offers a way of working that suits all, in a community that thrives on inspiration and collaboration. Perfectly located close to Northampton town centre and within walking distance of all amenities. The site houses both office and workshop based members making it a truly unique site. Offices are fully furnished, with dedicated work and break out areas, private meeting rooms, high speed internet, artisan teas & coffees, fresh fruit and community events all included. Four-storey Victorian building, ideally suited for one to four person businesses. Offices are ready to move in, and are unfurnished, heated, carpeted, and decorated. The simple and straightforward occupation process can be completed in just a couple of days. A busy, friendly environment. Charges fully inclusive of rent, electricity, gas, cleaning and maintenance. Minimum commitment is one month. The building has an entry door system, and kitchen and vending facilities, with limited parking available. This is a character office with flexible working space and terms. There is car parking on-site and the building is within a couple of hundred metres of the town centre. The building was fully refurbished in 2011 and has a secure entry system. There are 11 separate rooms of varying sizes and there are toilets on four floors and shower room in the basement. There is wheelchair access to the building and disabled toilets on the ground floor. This is a fabulous building and is located on the street that was voted high street of the year (2015) in a national competition. 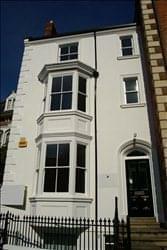 It has 11 rooms on three floors and has been tastefully refurbished. The owner is based on site and therefore can offer flexible terms and as the building is not VAT registered the prices advertised are the prices you pay.